Union Square in Somerville, Massachusetts was turned into a DIYer/makers playground this past weekend. Artisan’s Asylum hosted a gathering for artists of all types so that they could show off their creations to the community. The RainyDayProject folks stopped by for a look and ended up staying the entire afternoon. Ok, part of it was because there was some excellent Octoberfest beers being served, but there was also a lot of interesting stuff being exhibited. 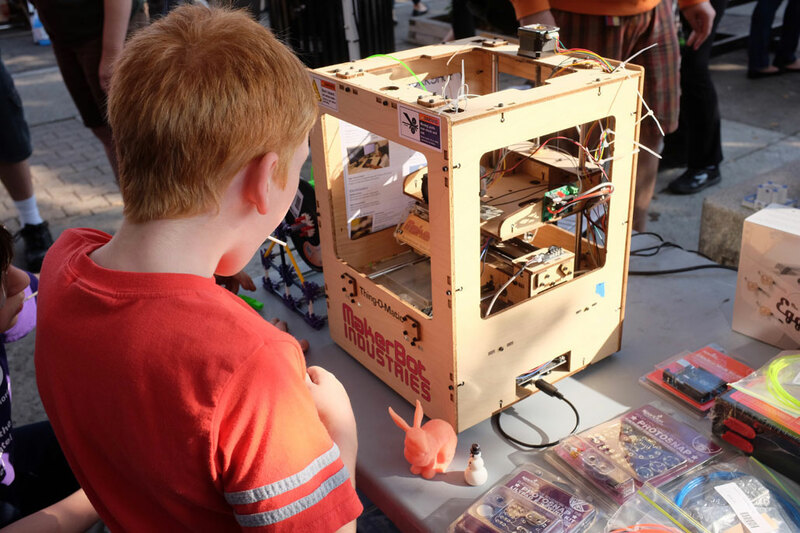 The buzz for DIYers this year has been the emergence of “affordable” 3D printers. We first reported on 3D printers in 2006. Back then 3D printers were strictly for companies like Nike and Apple because they were the only ones who could justify using them for rapid prototyping because of the $100K price tag. Today, desktop 3D printers are in the $1500 range and are affordable to hobbyists, inventors, and designers. While not quite “plug-n-play,” 3D printers have simplified enough that almost anyone with reasonable computer skills can operate them. While these devices have some very interesting potential, they are by no means ready for prime time. The primary issue is that the item “printed” is not really usable. It is a facsimile of the actual object in plastic. Great for prototyping ideas, but not so much for replacement parts…YET. The second issue is that the 3D data for generating the part has to come from somewhere, so you either have to 3D scan the item, or create it from scratch using 3D software (which has a learning curve). The third issue is that “printing” a part can take hours, sometimes days, depending on the level of complexity. If something were to go wrong during the printing, the entire job has to be restarted from the beginning. None of these problems are show-stoppers and all of them are solvable. Someday, they will be non-issues. Just not today. Not all 3D tools for makers are boxes sitting on desktops. Some, like the 3Doodler, are small enough to fit in the palm of the hand. The 3Doodler is not a 3D printer, but a pen which lets the user “draw” 3D objects in the air. The inventors of the 3Doodler wanted to raise a modest $30K on Kickstarter to create a batch to gauge interest. The funding project went viral and ended up raising over $2M from 26,000+ backers. 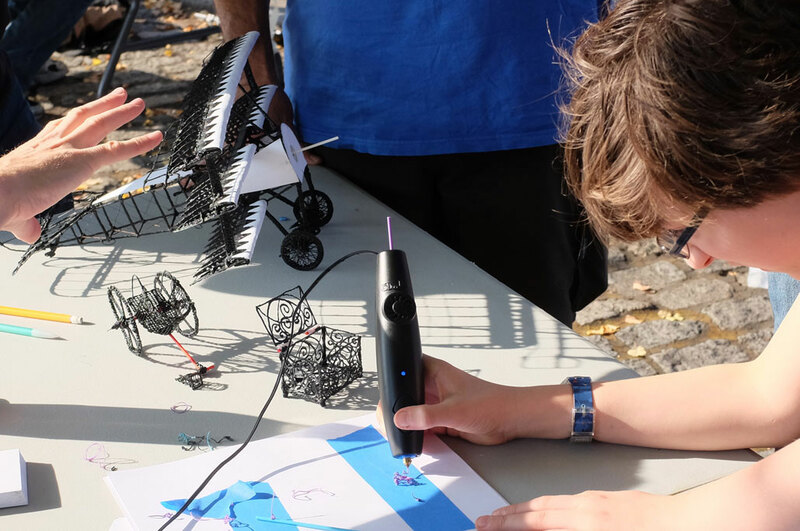 We had a chance to get some hands-on time with the 3Doodler. The pen is about the size of a small electric screwdriver. It takes a little bit of adjustment to get the feel of it, but it is very cool once you do. The process of drawing does take a bit of patience. However, very intricate shapes may be created once the technique of 3D drawing has been mastered. The 3Doodler folks are ramping up production to fulfill the initial 30,000 orders. Once they have worked through the backlog, they will then start thinking about the next what is next. 3D printers are cool, but multi-rotor copters are completely awesome. We first reported on quadcopters in 2005, back before drones became part of the lexicon. Back then, all you could do was fly them around and buzz the cat. 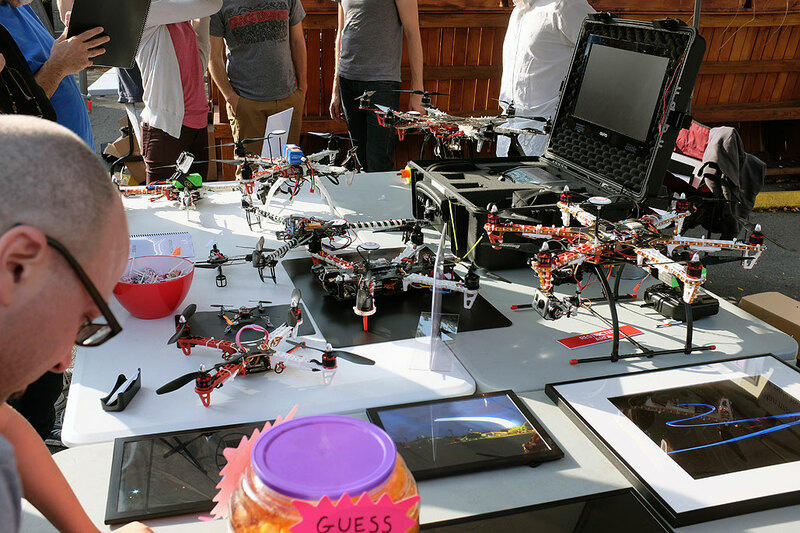 Like early home computers, multi-rotor copters are still mostly built by hobbyist and DIYers for fun, experimentation, and research. Still, it is great to see the community thriving, making progress, and generally having a blast. While multi-rotor flying machines still rare, they are now much more sophisticated and functional. They can now fly in packs (some autonomously), perform complicated maneuvers, and lift relatively heavy payloads. Some even do stuff that people will actually pay money for (like aerial surveying). The folks at MetroMultiRotor had a large booth with an assortment of multi-bladed copters on display. Completely awesome!!! Some of us were around at the beginning of the the home-computing age. While we never attended any of Homebrew Computer Club meetings, we “heard” that those gatherings were very similar to this weekend’s Makers Faire. Are we witnessing the dawn of another revolution? Time will tell.